Create a tiny library of 30 miniature books, complete with bookcase. Once upon a time, there was a library full of tiny tales and diminutive storybooks. Were they made by industrious, bookbinding elves? Hardly. They were made by a crafty young reader from this cute kit. Budding book artists can create an adorable collection of 30 miniature volumes that you can really read (magnifying glass not included). 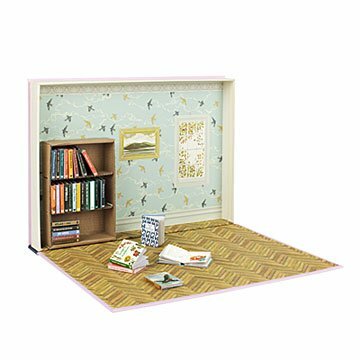 From illustrated fairytales like The Frog Prince to well-loved nursery rhymes like The Owl & The Pussycat and books of birds, butterflies, and flowers, this doll-sized library also comes with a sweet little bookcase to assemble. The set includes templated titles like "My Miniature Adventure" and two blank books to complete with their own stories and drawings. Even the book-like box opens to become a reading nook playset. When story time is done, it's a handy place to store everything until the next round of play. It makes a great do-it-yourself gift for creative fairy librarians. Includes detailed instruction booklet. Made in China. Plus 10 books to complete yourself! Bookshelf wouldn't stay together, had to use binder clips and glue. Fiddly to put the books together but also cute end product. Wouldn't buy again. My friend loves it and is so excited to put the books together. The gift wrapping was pretty too! Although I love this website, I was not impressed with this product. I would order again from the website though! This is a great present! I gave this to my 11 year old son for Christmas and he loves it! We've been assembling it together, which is a blast. The stories are great, the details are perfect, the price is great. I'm ordering more to have them on-hand for kids birthday presents, it's a really nice gift. My niece adored this gift and couldn't be torn away from it once she started assembling the books. She built a sofa and table to go with it and loved adding her own miniature books to the library. There's a lot of cutting and gluing, which was fine for her but does create a mess if your kid isn't great at cleaning up. It comes with a sheet for each mini-book as well as extra sheets to make your own. I liked how you can pack it up like a book itself, which my niece pointed out happily. The attention to detail makes this adorable mini library a a treasure. My daughter spends hours creating her own little world. My granddaughter uses this in imaginative play with her miniature animals. It has also inspired her to write some of her own short stories. In my opinion, this is a better "toy" than I imagined from the description. I'm very pleased with this item and with the great selection of interesting items offered by Uncommon Goods. I haven't gifted this yet but I love that it's not only a mini-library, it has actual tiny versions of real books to put together. This is going to be the perfect add-on to my niece's dollhouse. Excellent addition to my miniature collection.